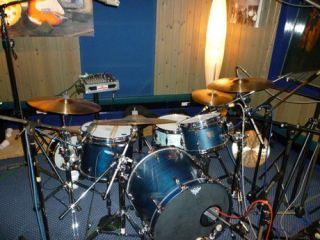 The London Drum Company have made an appeal for drummers to be on the lookout for gear looted from their Croydon lock-up during the London riots. Gretsch US Maple Satin Blue with chrome hardware (pictured above): 12"x8",12"x9", 14"x11", 16"x 13", 22"x18"
DW Broken Glass: 13"x10", 16"x14", 18"x16", 24"x20"
Sonor Force 3000: 12"x9", 16"x16", 22"x20"
All the above was cased in Protection Racket bags. Percussion bag containing various tambourines and shakers. If anyone has any information on any of the above please email us at rhythm@futurenet.com and we will pass the information on.